Had a boring old week really - had to spend each day of this week at the hospital which has been really frustrating! Still! We had a good laugh on Saturday at the workshop at Knit-Wise with Mark, Heather and Alison who all spun valiantly all day through wind rain and cold. We were inside drinking tea and coffee like there was no tomorrow but some poor bride braved the elements to get married so we didn't feel too badly done by. Here are the finished skeins by the rightly proud spinners, it's always great to meet people with the same passion as yours, but also new friends from Ravelry and Etsy. Alison came all the way down from Blackpool - thats dedication and Heather came from locally but is off to London so it was nice to have her company even for a short time. Mark ventured upstairs from the shop and gave everyone the height of abuse but even so I've put his picture on here. 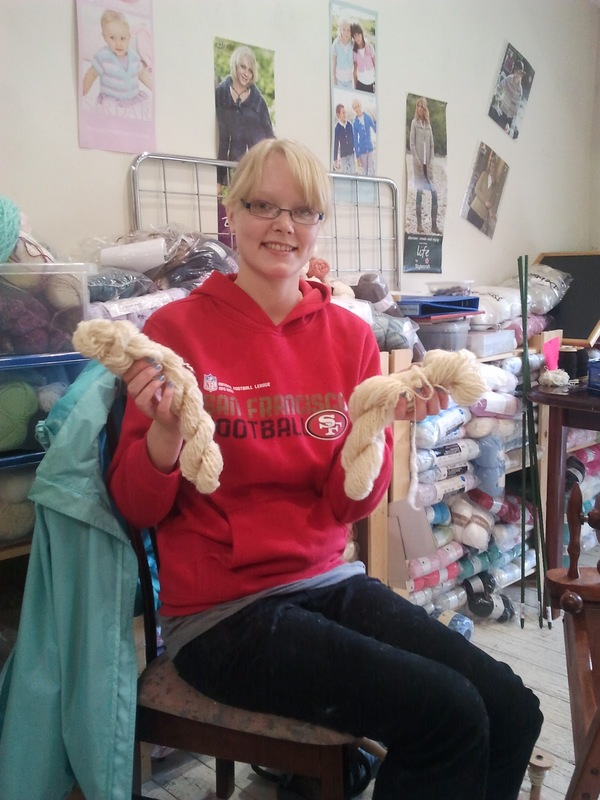 Heather is the first of my students ever to have spun two skeins on the day and as well as her superior intellect and natural talent I think that her having drop spindled made a lot of difference. 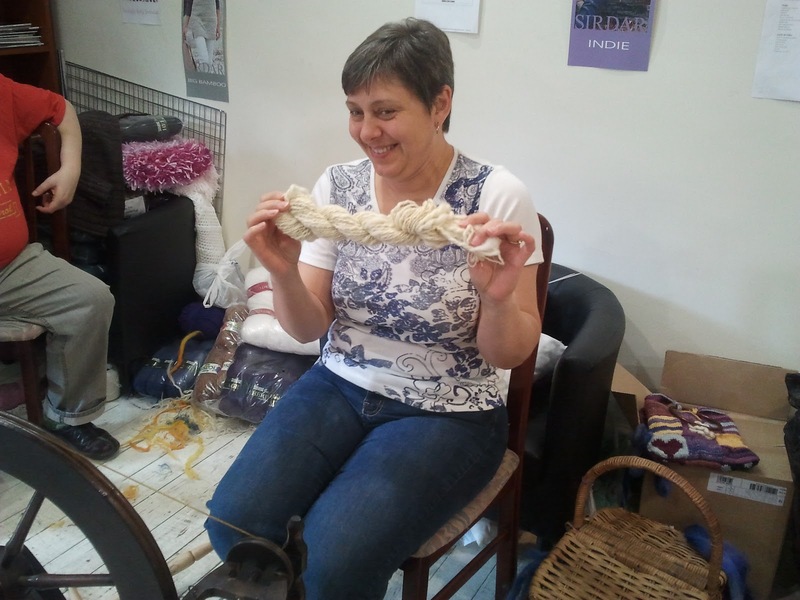 We're spinning again at Knit Wise on the 15th of October if you'd like to come along. 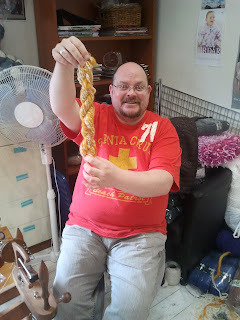 There is a world record spinning attempt on the 24th of September, some brave spinners are attempting to spin the longest piece of unbroken yarn for an hour and we all wish them the best. There is more information on the Campaign for Wool website. I'll try and post the outcome on here. The niddy noddies and lazykates that I've had on my etsy page are sold out through the shop but I'm hoping to get more made up asap. I'd like to have some that are a bit more fancy for next time. Special occasion Niddy Noddies! Can't wait.